The Ariel Season reminds me of MY grail the Belle Designer.Which i got from unibear not to long ago! Well, this has sat idle for way too long. OK, this particular pin reminds me of this lanyard/pin set. This is because I originally bought the Designer Belle with the hope of trading for this lanyard/pin set from a fellow DPFer (can't remember who). But, after I purchased it they told me they already traded for Designer Belle, so no pin/lanyard set for me (until I bought it for about $100 later). In retrospect, they should have made the trade since the lanyard/pin set still goes for $100, but the Designer Belle goes for considerably more. Mainly because it was the first pin set I ever bought , I traded them all away for pins I thought were excellent but turned out to be mostly scrappers I ended up buying myself a second set on a subsequent visit . 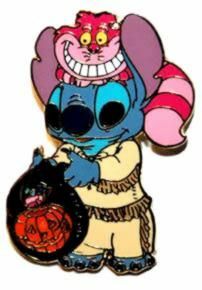 The pink colors on the Goofy pin, and the shop in the background made me think of this Stitch pin. And he's got ice cream!! 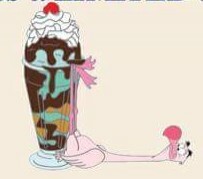 Well, ice cream reminds me of all of the fabulous Pin Trader Delight pins from DSF. Here's one of my favorites. OK, the Cheshire Cat and a furry hat made me think of this! This has sat dormant for awhile, so here we go... One of my favorite parts about Philharmagic (spoiler alert) is the end part where Donald is shot through the air and ends up in the back of the theater. This vinylmation pin reminds me of that and is really cute! Thought I'd try to revive this thread again... that little traffic light or whatever it is makes me think of the honking horn birds in Alice in Wonderland! All that luxurious hair makes me think of this pin! I'm going to be lame but, it made me think of the Belle pin from the same series. I love that she faces the opposite direction of the rest of the pins in the series. This is one of my favorite scenes and songs in the film, and the pin is just so pretty!​ After I obtained this pin, I went around the house singing "Painting the Roses Red" for about a week! This reminds me of one of my favorite scenes from the movie—The croquet scene. Naturally that reminds me of this pin today! Well, the pin from Brother Bear made me think of bears. Humphrey is my favorite bear from Disney, and this is my favorite Humphrey pin. It has about the same color scheme as the last one also!